TGIT worlds will collide later this season when Annalise Keating and Olivia Pope share the screen during How to Get Away with Murder and Scandal crossover episodes. 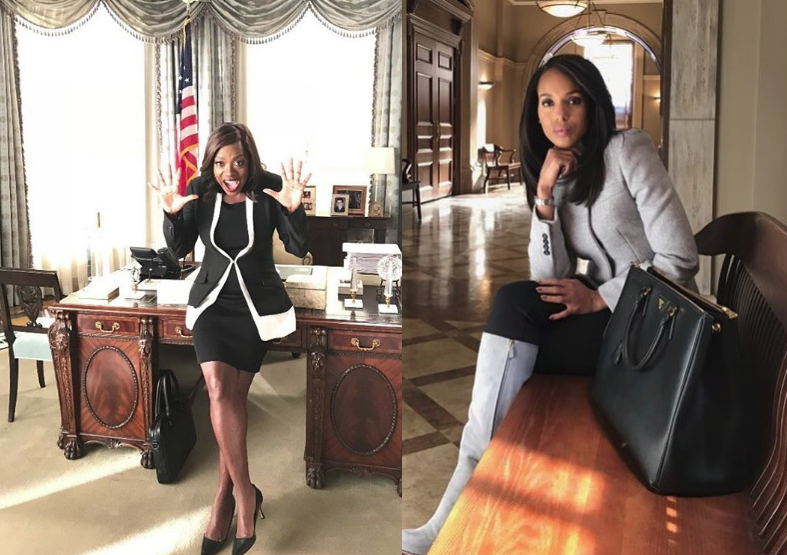 Kerry Washington and Viola Davis posted the news on Instagram early Wednesday morning. The Scandal crossover episode was written by Raamla Mohamed and directed by Tony Goldwyn. The How to Get Away with Murder crossover episode was written by Morenike Balogun & Sarah L. Thompson and directed by Zetna Fuentes. As previously announced, new TGIT episodes of Grey's Anatomy, Scandal and How to Get Away with Murder return on Thursday, January 18, on The ABC Television Network, streaming and on demand. How to Get Away with Murder stars Oscar-winner Viola Davis as Professor Annalise Keating, Billy Brown as Detective Nate Lahey, Jack Falahee as Connor Walsh, Aja Naomi King as Michaela Pratt, Matt McGorry as Asher Millstone, Karla Souza as Laurel Castillo, Charlie Weber as Frank Delfino, Liza Weil as Bonnie Winterbottom and Conrad Ricamora as Oliver Hampton. Scandal stars Kerry Washington as Olivia Pope, Guillermo Diaz as Huck, Darby Stanchfield as Abby Whelan, Katie Lowes as Quinn Perkins, Tony Goldwyn as President Fitzgerald Grant, Jeff Perry as Cyrus Beene, Joshua Malina as David Rosen, Bellamy Young as President Mellie Grant, Scott Foley as Jake Ballard, Joe Morton as Rowan Pope, Cornelius Smith Jr. as Marcus Walker and George Newbern as Charlie.